A dental mouthpiece, or oral appliance, can help patients with sleep apnea enjoy better breathing which promotes healthier sleep. However, not all dental appliances for sleep apnea are created equally. Dr. Dan Hilton offers the latest in patient comfort and treatment benefit with obstructive sleep apnea dental appliances from the ResMed Narval CC™ in Woodland Hills, CA. 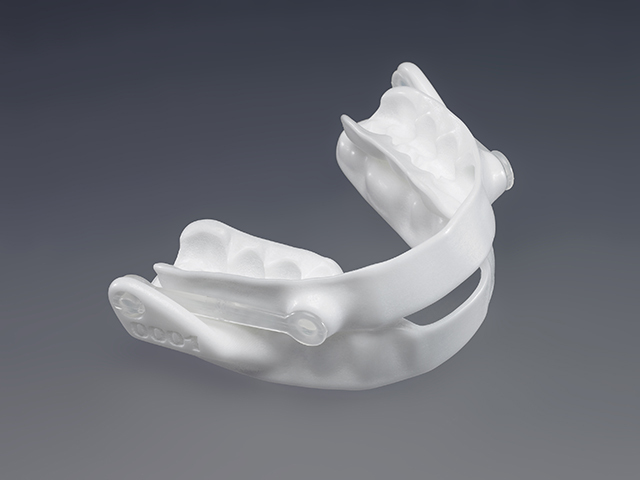 When visiting a dental office for the treatment of sleep apnea, it is likely that you will be offered an oral appliance that looks like a large retainer with connective components on each side. These appliances move your jaw forward to prevent soft tissue collapse at the back of the throat that blocks airways in sleep apnea patients. While this is effective, it can produce unintended side-effects, such as pressure on teeth and jaw joints. Improved Comfort – The Narval CC™ appliance is made of a flexible nylon material, and isn’t bulky, to be gentle on teeth and soft tissue. Patients who wear this appliance for sleep apnea treatment do not experience the same discomfort that inflexible plastic can create when worn over long periods. Reduced Joint and Teeth Stress – Because the Narval CC™ keeps jaw alignment in a natural position, less stress is placed on jaw joints and on teeth. This reduces the likelihood that patients will experience TMJ and teeth alignment issues while using the Narval CC™ sleep apnea appliance. More Consistent Treatment Compliance – All of these added benefits help patients feel more confident about wearing their appliance as recommended. Consistent treatment compliance and use of the Narval CC™ sleep apnea dental mouthpiece allows patients to experience better sleep each night. RedMed’s Narval CC™ sleep apnea dental mouth guard was created based on the treatment logic of several different dental specialties to create the best of both worlds: patient comfort and compliance, which promotes best results and alleviation of apnea symptoms. Each Narval CC™ oral appliance for sleep apnea patients at our Woodland Hills dental office is uniquely made for you with precise CAD/CAM technology. The result is a dental mouthpiece that can be adjusted to best address soft tissue collapse at the back of the mouth. The unique way that these devices are created and made to be precisely adjustable allows Dr. Hilton to make sure that your sleep apnea appliance is as comfortable as possible and helps to effectively alleviate symptoms, like snoring and stop-and-go breathing. Dr. Hilton is committed to providing sleep apnea patients with the most comfortable and effective solutions for their sleep breathing issues. With advanced oral appliance therapy from ResMed Narval CC™, we can deliver on those commitments and help patients enjoy better overall wellness. To learn more about this improved dental device for sleep apnea, contact Dr. Hilton and his team today.